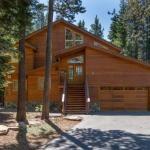 Boasting a tennis court Hansel features accommodation in Donner Pines Tract with access to free WiFi and mountain views. The accommodation is 41 km from Reno. The holiday home features 1 bedroom a TV an equipped kitchen with a dishwasher and an oven and a bathroom with a bath or shower. The holiday home offers a children's playground. A bicycle rental service is available at Hansel while skiing can be enjoyed nearby. Carson City is 46 km from the accommodation while Sparks is 46 km away. The nearest airport is Reno-Tahoe International Airport 43 km from Hansel.